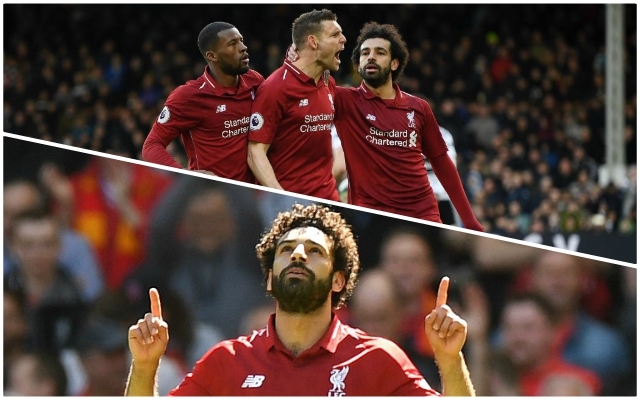 Mohamed Salah failed to score yet again despite the Reds beating Fulham 2-1 on Sunday to return to the top of the table. Salah was looking to etch his name in the annals of Liverpool by scoring his 50th goal in a red shirt. Had he netted against Fulham he would have done so in 67 games; that would beat a record set by Fernando Torres who achieved the feat in 72 matches. On the day, Salah was lively and carved out opportunities for himself that he was somewhat unfortunate not to finish. That said, the Egyptian was at times maybe too desperate to score a goal for himself, which led to him rushing the chances that came his way against Fulham. Mohamed Salah has now gone 7 matches without a goal; it’s his third longest spell since 2014. The 26-year-old has now gone seven games without a goal in all competitions; last season he was insanely prolific scoring 44 goals for us including 36 in the league. His barren run can be explained by the fact that the opposition are more alive to his movement and characteristics. This has also benefited Sadio Mané down the left, who, like Salah, has now scored 17 goals in the league. Although Mo may not be popping up with goals at the moment, his mere presence strikes fear into defenders and frees up space for Roberto Firmino, Mané, and midfield runners to exploit. As long as we can keep winning games, and Salah keeps putting in performances, that’s alright with us! The goals will come for him and we’re top of the league again!